DUBLIN, Ireland, 2018-Sep-13 — /Travel PR News/ — Ryanair, Europe’s No.1 airline, today (11 Sept) announced its first ever flights from Exeter, its newest airport, with 3 new routes to Malaga, Malta and Naples commencing in April, as part of its Summer 2019 schedule. Exeter consumers and visitors can now book their holidays for summer 2019 on the lowest fares. To celebrate, Ryanair has launched a seat sale with fares on its new Exeter routes available from just £34.99, for travel in April, which must be booked by midnight Thursday (13 Sep) only on the Ryanair.com website. 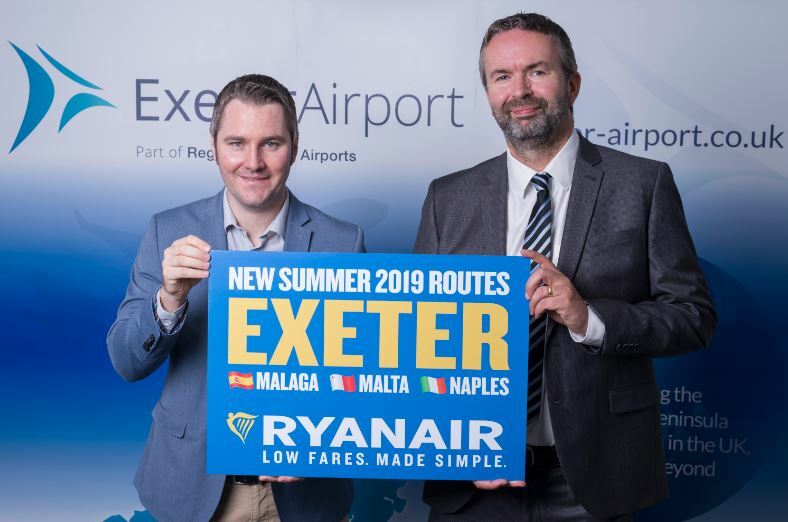 “We’re pleased to announce Ryanair’s low fares have arrived at Exeter, our newest airport and 21st in the UK. Our three new routes to Malaga, Malta and Naples start in summer 2019, each operating twice weekly, ensuring customers in the Devon region can book low fare flights to the sun. Ryanair is Europe’s Number 1 airline, carrying over 139m customers p.a. on more than 2,000 daily flights from 86 bases, connecting 224 destinations in 37 countries on a fleet of 430 Boeing 737 aircraft, with a further 240 Boeing 737’s on order, which will enable Ryanair to lower fares and grow traffic to 200m customers p.a. by FY24. Ryanair has a team of more than 13,000 highly skilled aviation professionals delivering Europe’s No.1 on-time performance, and an industry leading 33-year safety record. In 2017, Ryanair became the first European airline to have carried over 1 billion customers. Exeter Airport is part of Regional & City Airports, the airports management division of Rigby Group plc. In the last five years passenger numbers have increased by 22% to more than 900,000 a year. This entry was posted in Airlines, Airports, Flights, Travel, Travel Services, Travelers and tagged Exeter airport, flights, Malaga, Malta, Matt Roach, Naples, Robin Kiely, Ryanair, summer 2019. Bookmark the permalink.